A peaceful place to browse, discover, and gather inspiration, shopping in St. Augustine makes for one of the most pleasant parts of any trip. Our streets are lined with one-of-a-kind boutiques offering everything from handmade goods to designer clothes, and all your favorite labels as well. Take a look at some of the most popular St. Augustine shops, and find something special to take home. St. George Street itself is a destination for international visitors, drawing shoppers to stores selling resort wear, jewelry, art, and everything in between. Stroll the Promenade and duck into galleries, surf shops, and chocolate makers, or pick up some novelty items at the dozens of well-stocked gift shops. An entire day's worth of shopping can be easily handled in one location before returning to your St. George Street accommodations. The go-to stop for essentials, the St. Augustine Outlets mean a much longer trip than the shops in town, but offer a far greater variety of top brands. With H&M, Hugo Boss, Kate Spade, Michael Kors and more, this is the perfect solution if you need to stock up before continuing your travels. Farther afield, a variety of specialty stores await. Oak & Adze is a quirky yet enticing boutique showcasing men's grooming products, bottles, flasks and more, while Cool & Collected Vintage Antiques offers one of the most well-curated selections of consignment goods in Florida. Anything you can hope to buy, you're sure to stumble across. Feel free to ask our front desk staff for tips, tricks, and personal favorites. An independent gallery featuring handmade jewelry, pottery, glass, home decor and so much more! 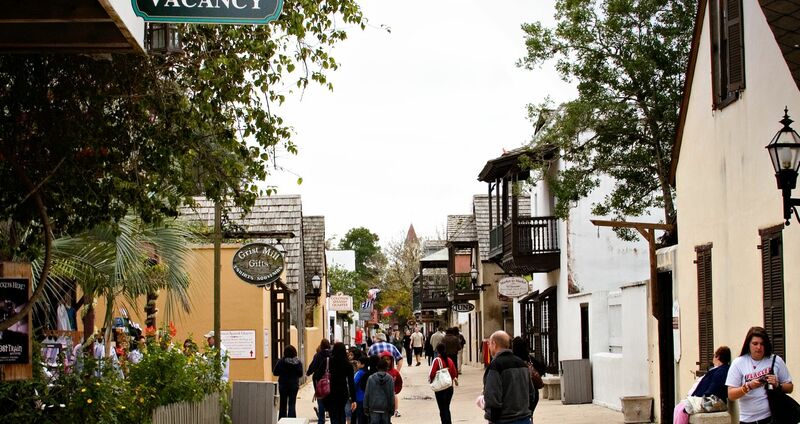 Take a break from exploring historic St. Augustine and treat yourself to a shoppers getaway. During your stay make sure to grab a gift for your four legged friend. Visiting the Old City Farmers Market every Saturday from 8:30 am - 12:30 pm. Explore the store's exclusive selection of spices, custom blends, loose-leaf teas, naturally flavored sugars, and more. The Starving Artist provides space, opportunity and services for artists beginning their careers and to provide affordable original art to the consumer. Quirky yet enticing boutique showcasing men's grooming products, bottles, flasks and more.